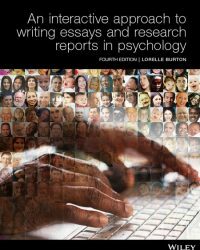 An Interactive Approach to Writing Essays and Research Reports in Psychology, 4th Edition is a writing guide that offers students an engaging, accessible introduction to the conventions of writing in the psychology discipline. Its straightforward, user-friendly style provides a thorough overview and is most suited for undergraduate students taking an introductory psychology course at university. The 4th edition contains an enhanced coverage of web research and writing and contains a new chapter on Qualitative Research. This new edition is written by the leading Psychology author and Teaching and Learning expert Lorelle Burton. It is a perfect companion to Psychology, Australian and New Zealand Edition, the author’s best selling undergraduate Introductory Psychology text in the market. Chapter 1. Where to begin?